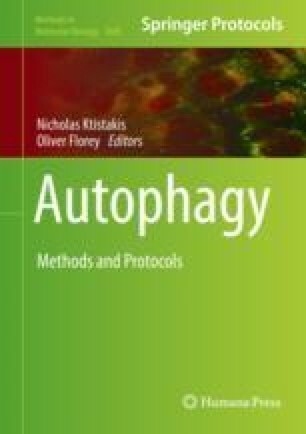 To appreciate the positive or negative impact of autophagy during the initiation and progression of human diseases, the isolation or de novo generation of appropriate cell types is required to support focused in vitro assays. In human neurodegenerative diseases such as Parkinson’s disease (PD), specific subsets of acutely sensitive neurons become susceptible to stress-associated operational decline and eventual cell death, emphasizing the need for functional studies in those vulnerable groups of neurons. In PD, a class of dopaminergic neurons in the ventral midbrain (mDANs) is affected. To study these, human-induced pluripotent stem cells (hiPSCs) have emerged as a valuable tool, as they enable the establishment and study of mDAN biology in vitro. In this chapter, we describe a stepwise protocol for the generation of mDANs from hiPSCs using a monolayer culture system. We then outline how imaging-based autophagy assessment methodologies can be applied to these neurons, thereby providing a detailed account of the application of imaging-based autophagy assays to human iPSC-derived mDANs. Maeve A. Caldwell and Jon D. Lane contributed equally to this work. This work is supported by a Parkinson’s UK project grant (G1402), a Wellcome Trust Ph.D. studentship awarded to NJM through the Dynamic Cell Biology program (grant number 083474), and a Medical Research Council Ph.D. studentship (to PS).